Back in early October, nine members of the University Center Activities Board (UCAB) Exec Board, piled into a school van at 4:15AM to begin our journey to Chattanooga, Tennessee for the 2008 NACA (National Association for Campus Activities) South Conference where about 60 programming boards from the southern region of the United States were present. 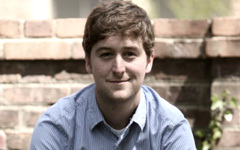 UCAB is William & Mary’s primary programming board and is entirely student run. We organize most of the major events on campus ranging from concerts, slam poets, and comedians to famous speakers and a large-scale end of classes bash. We attended this conference not only to represent the College but also to seek out potential performers and talent to bring to campus this spring semester. 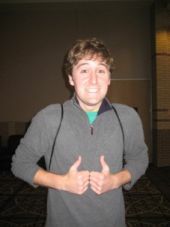 We attended showcases, educational sessions on how to be a better board, and had some fun while we were at it. Genny (Publicity Chair) and I (Director of Public Relations) even presented an Ed Session to students from other universities about how to deal with common PR problems affecting programming boards. As you can see, I was pretty excited to be there. Prior to Chattanooga, programming boards were able to submit applications for awards with the top one being the Board of Excellence (BOE). A small number of schools (William & Mary being one of them) were then chosen to make a presentation to judges at the conference. On the last night there, all of the attendees gathered for the closing banquet and awards ceremony. When the BOE award presenters began to talk about the winning school, mentioning a programming board of 150 members with new sustainability initiatives and an iconic squirrel mascot, we could not contain our excitement. 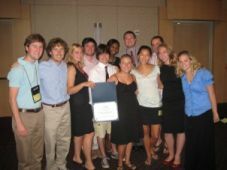 William & Mary’s UCAB is NACA South’s Board of Excellence for 2008, which is a huge honor! Also at the banquet, Katy, our Director of the General Board, was given the 2008 Student Leader Award, and it couldn’t be more deserved. We made the 11 hour drive back to Williamsburg with a necessary dinner stop at Chipotle, and we couldn’t wait to tell the rest of UCAB and William & Mary about the prestigious award.